A new artwork by Freee art collective commissioned by The Royal Shakespeare Theatre, Stratford-upon-Avon, for the exhibition 'Well Said!' 19th March-18th September 2016. Freee produced 50 new versions of the Othello quote "he hath a daily beauty in his life / That makes me ugly". They have asked a number of people to choose one statement they believe in and invited the participants to handwrite the text on paper. These acts have been photographed to create a full size billboard poster that has been pasted directly onto the gallery wall. 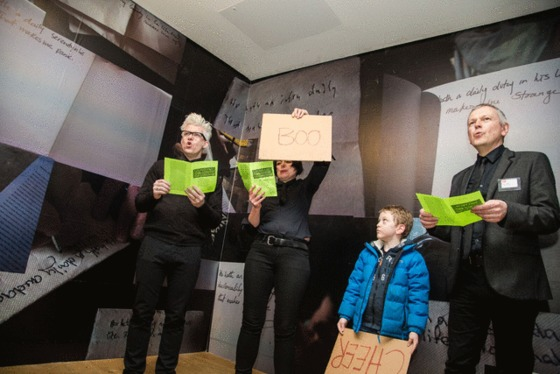 On the exhibition opening night Freee read out their 50 versions of the quote to visitors. Audience members were asked to boo or cheer. The new work aims to complicate the relationships between the original author; Freee as new authors and the participants as choice-makers.